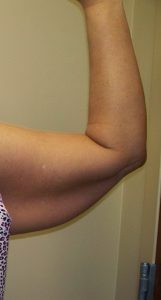 Growing older, heredity, and weight fluctuations can cause your upper arms to have an appearance of drooping or sagging. This is something that cannot be fixed through exercise. Arm lift surgery may be the surgery for you if the underside of your upper arms appears loose or sagging and is full due to extra skin and fat. During your recovery from arm lift surgery, gauze or bandages may be applied to your incisions, and your arms may be covered in elastic bandage or a garment that will compress them to minimize the swelling. You will be given direct instructions on how to care for the surgical site and drains, what medications to apply or to take orally for healing, certain concerns to be aware of, and when the best time is to follow up with your plastic surgeon. 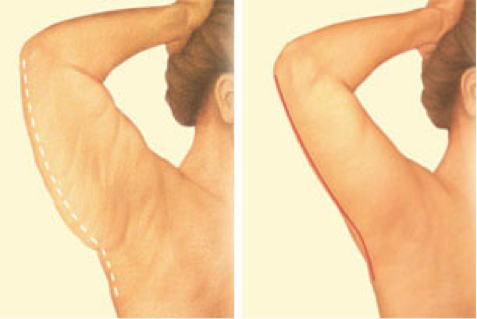 Incisions are generally placed on the back of the arm, depending on the surgeon’s preference, and may extend from the underarm (axilla) to just above the elbow. 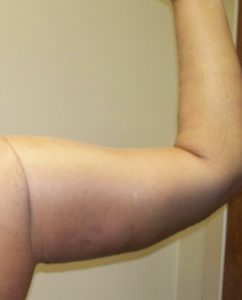 Excess fat may be directly excised or treated with liposuction. The choice to have plastic surgery is completely personal, and you will have to decide if the results will fulfill your goals and if the potential complications and risks of arm lift surgery are acceptable.